Almighty and everlasting God, who didst give to thine apostle Bartholomew grace truly to believe and to preach thy Word: Grant that thy Church may love what he believed and preach what he taught; through Jesus Christ our Lord, who liveth and reigneth with thee and the Holy Ghost, one God for ever and ever. Almighty and everlasting God, who gave to your apostle Bartholomew grace truly to believe and to preach your Word: Grant that your Church may love what he believed and preach what he taught; through Jesus Christ our Lord, who lives and reigns with you and the Holy Spirit, one God for ever and ever. The name "Bartholomew" appears in the New Testament only on lists of the names of the twelve apostles. This list normally is given as six pairs, and the third pair in each of the Synoptics is "Philip and Bartholomew" (M 10:3; P 3:18; L 6:14; but A 1:15). (1) "Bar-tholomew" is a patronymic, meaning "son of Tolmai (or Talmai)." It is therefore likely that he had another name. (A historical novel which may not be well researched informs me that a first-century Jew would be likely to use the patronymic instead of the forename as a mark of respect in speaking to a significantly older Jew.) "Nathanael son of Tolmai" seems more likely than "Nathanael also called James (or Simon)." (2) Nathanael is introduced in John's narrative as a friend of Philip. Since Bartholomew is paired with Philip on three of our four lists of Apostles, it seems likely that they were associated. We have no certain information about Bartholomew's later life. Some writers, including the historian Eusebius of Caesarea (now Har Qesari, 32:30 N 34:54 E, near Sedot Yam), say that he preached in India. The majority tradition, with varying details, is that Bartholomew preached in Armenia, and was finally skinned alive and beheaded to Albanus or Albanopolis (now Derbent, 42:03 N 48:18 E) on the Caspian Sea. His emblem in art is a flaying knife. 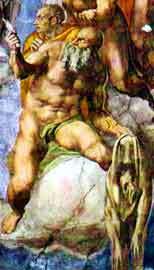 The flayed Bartholomew can be seen in Michelangelo's Sistine painting of the Last Judgement. He is holding his skin. The face on the skin is generally considered to be a self-portrait of Michelangelo.